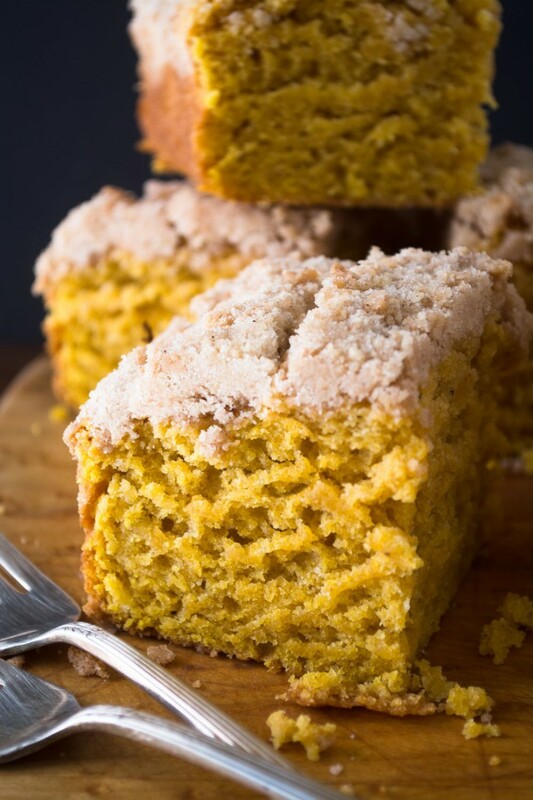 My favorite Pumpkin Crumb Cake is a classic fall coffee cake enriched with pumpkin and perfectly spiced. It has become a holiday breakfast tradition in our house! 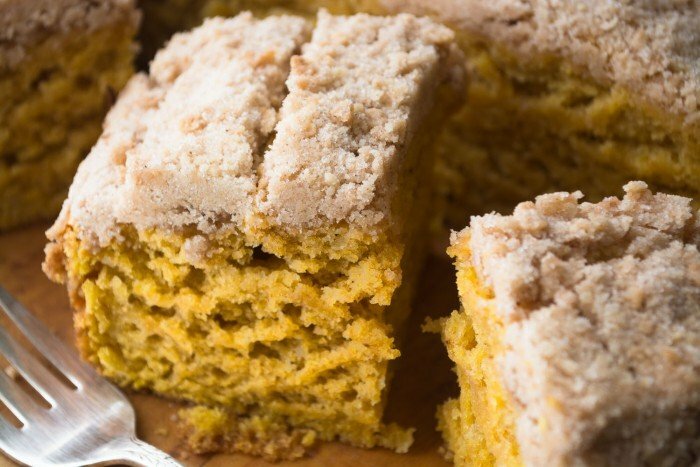 Wow, I sensed from the aroma coming out of my oven that I was in for a treat with this Pumpkin Crumb Cake, but when I opened the door and got a peak at it, that sealed the deal. 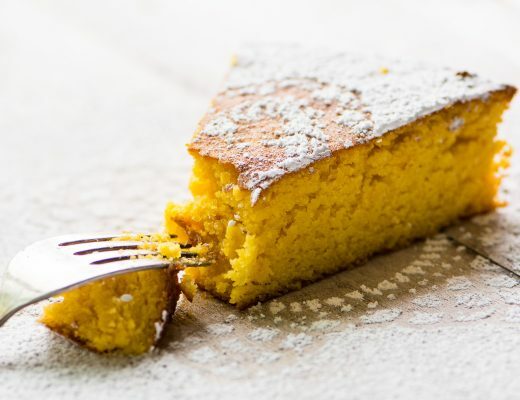 It rises up nice and tall, with cracks along the crumb topping that reveal a glimpse of the bright saffron colored cake underneath. 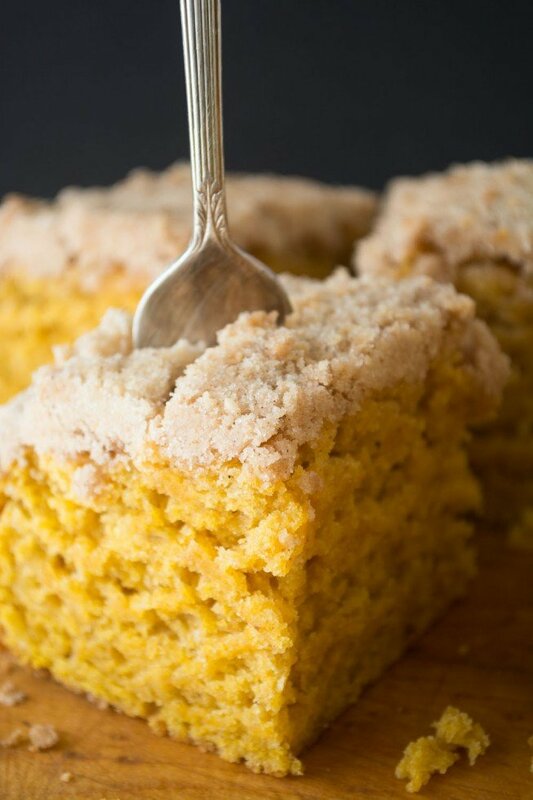 This delicious crumb cake is patterned after my classic New York style Cardamom Crumb Cake, so I knew it was going to be good, but the addition of my favorite fall squash took it over the top. This cake pushes all my buttons. If you love pumpkin like I do I think you’ll be pleased. 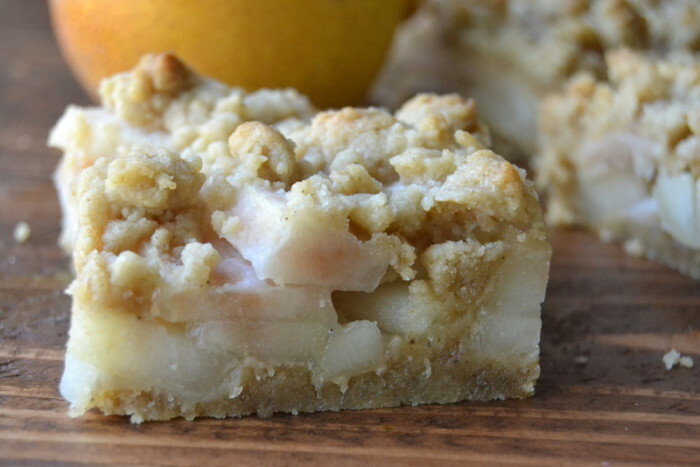 It’s the perfect little baking project to ease you into fall. And you can eat it for breakfast. Win win. This cake has a luxurious, loose crumb, and a gorgeous golden color. 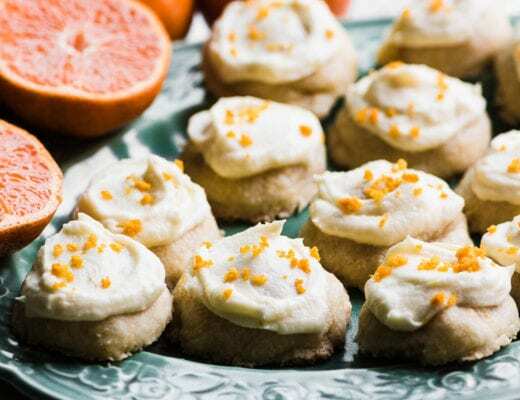 Pumpkin puree, like mashed banana or applesauce, gives cakes and breads great texture, and that flavor and color screams ‘hello fall!” It’s just sweet enough to qualify as cake, without being too sweet. And the spicing is kept in check too, which is why it works so well as a morning treat. The hardest part about it is waiting the hour for it to cook, but luckily there’s no need to let it cool completely before digging in. I highly recommend this one, it is easy and really wonderful. I wrapped squares of it in plastic and my daughter grabbed one every morning on her way out the door. It kept beautifully for a week. Spray a 9x9 square baking dish with cooking spray. I like to line it with sheets of parchment with long ends, so I can lift it out after baking for easy cutting. This is optional. Put the flour, sugar, baking powder, salt, and spices in the bowl of a food processor fitted with the blade. Pulse to combine everything well. Cut the cold butter into pieces and add them to the processor. Process by pulsing repeatedly until the butter has been incorporated and the mixture has a crumbly texture. About 20-30 pulses, more or less. Remove a cup of the dry mixture and put in a small bowl. Toss with 1/4 teaspoon of cinnamon and set aside for the topping. Whisk the eggs, pumpkin, and sour cream together in a large mixing bowl until smooth. Add in the flour mixture and stir just until everything is mixed, but don't over beat it. Spread the batter in the prepared pan, evening it out with a spatula. Sprinkle the reserved crumbs evenly over the top. Bake for approximately 55-60 minutes, or until risen in the center and a toothpick comes out clean. 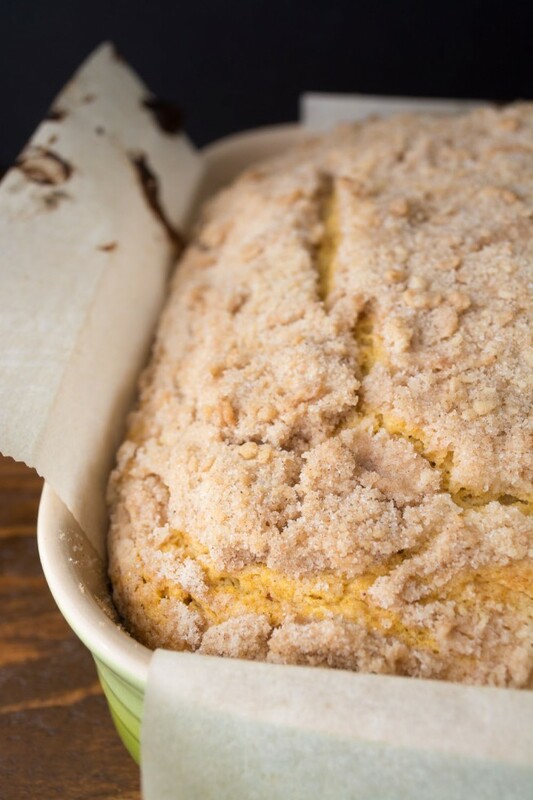 Have you tried my Lemon Sugar Crumb Cake? It’s for serious lemon lovers! 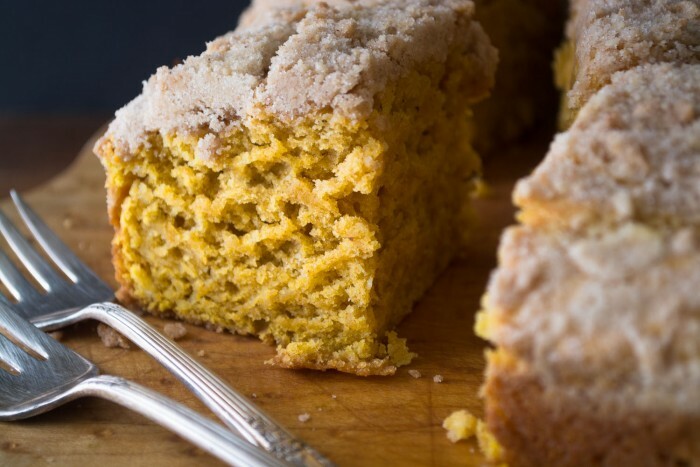 Don’t forget to pin this Pumpkin Crumb Cake! Looks delicious! 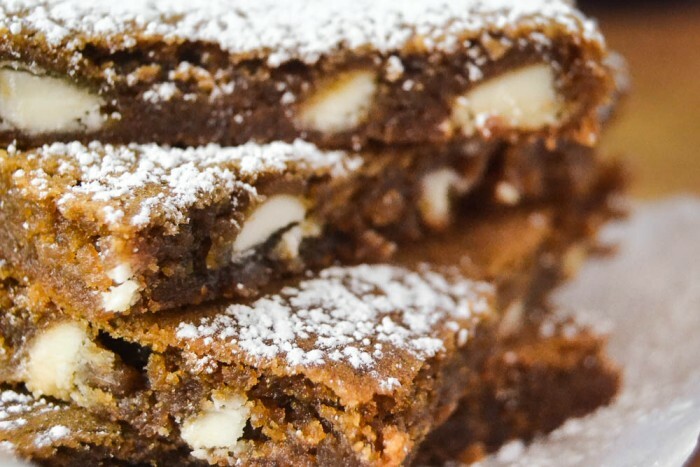 Just checking – how much cinnamon is used in the topping? Under Ingredients it says 1/4, and in the instructions you say 1/8 tspn. Thank you! That was a typo, it’s 1/4 tsp Janet, thanks for spotting it! OMGosh my sister just sent me your Lemon Crumb Cake (we both LOVE super Lemony Tart things) and I found this! I love pumpkin too! We have organic canned pumpkin year-round here. Can’t wait to make this! Hi Sue! This was mighty tasty but my crumb cake turned out rather dense. Any suggestions for the next try at this? Hey Carrie ~ the texture of a classic New York style crumb cake is on the dense side, but it should be a pleasant texture. Make sure you don’t over mix the batter at the end. I just made this and it has been attacked while still warm. Comments were fantastic! Imagine if they let it sit and get cool. Awesome recipe, I did sub greek yogurt for sour cream and I did add some cardamom to both the cake and crumb topping, from your other recipe. Too yummy, nice with coffee. I made this, flavor was awesome but came out a bit dry. I noticed no milk in the recipe? Was wondering if it was left off my mistake hence the cake being to dry? The pumpkin puree and sour cream should be enough, Rook. You can certainly add a bit of milk if you like the next time. Make sure you measure your flour by fluffing it first and then scooping — too much flour might have caused the dryness. This cake sounds fantastic! 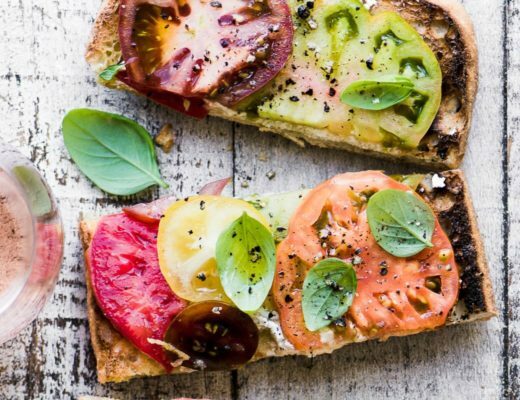 I would be eating slices for breakfast, with plenty of coffee on the side. Yay! This is the BEST!!! This has to be my favorite pumpkin recipe. Thanks, Sue! Sue, this is gorgeous! And I truly think I can smell the wonderful autumnal aromas — does my computer have smellavision?! I had lots of roasted pumpkins last days, but still haven’t bake anything with it yet. Your crumb cake looks super duper delicious, Sue. Yup! It’s a keeper! I made it as soon as I saw the post this morning! Just had a piece with tea … wonderful! This looks delicious! 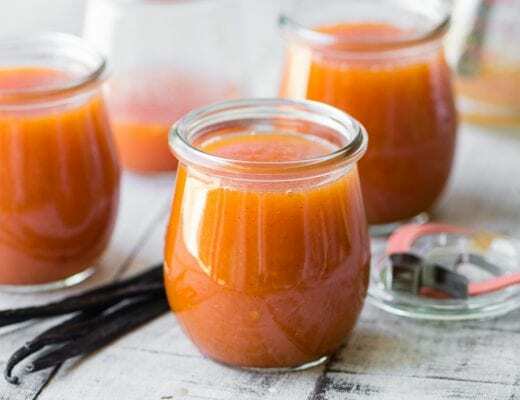 We are just heading into spring here in Australia but I have a small amount of pumpkin left from our autumn harvest which I will be using it to make this recipe. Looking forward to having some of this for breakfast! YUM. 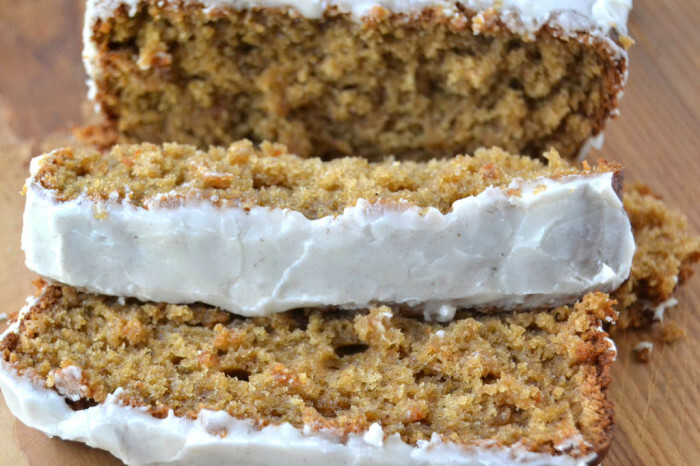 I love snack crumby cake like this.. and your pumpkin cake looks so moist and delicious. I wish I had a slice with my tea now. Can you come down to San Diego with this cake? I’ll pay for gas, ingredients, and then drinks out :) It looks amazing!! Want.it. Haha, watch out what you wish for, I might take you up on it!! This feels like fall has arrived! What a moist beautiful cake Sue. What a good looking cake. Where has the summer gone? Hi, what do you mean by pumpkin purée? Just blend raw pumpkin? I mean the canned kind, Asterina, I find that it’s better than trying to puree fresh pumpkin. Oh that crumb topping is divine, you’ve almost convinced me to open that first can of pumpkin ;). Yayy pumpkin stuff! It’s almost that time of year!